Infrastructure around the country is in dire need of an upgrade. As the population has grown, road and bridge maintenance has faltered and industrial use of certain areas has diminished. As a result, national, state and local governments need to look to innovative funding solutions for their critical infrastructure projects. California has recently enacted legislation allowing local governments to plan, implement and fund infrastructure projects that support human and environmentally sustainable economic development. One of these projects, West Sacramento’s Bridge District, provides a valuable model for other jurisdictions to replicate, as it is using creative financing to plan the transformation of an area from industrial wasteland to sustainable, mixed-use development. In 2009, the City of West Sacramento adopted the Bridge District Specific Plan, an updated version of an earlier plan intended to provide the infrastructure for energy-efficient, mixed-use development of a choice 188-acre Sacramento riverfront site. Like many cities, West Sacramento had its origins on a waterfront. For much of the 20th century, the district had served industrial uses including Rice Growers Association of California storage silos, a CEMEX cement terminal, a Weyerhaeuser paper recycling facility, and the State Box Company, all supported by proximity to rail and highway transport. By the end of the century, many of these companies had ceased their operations, leaving large parcels of land underused, vacant and/or contaminated. West Sacramento’s riverfront reflected industrial processes that predated current standards for protecting air, water, and soil quality; now it reflects the changes to an economy that is no longer based on industry. 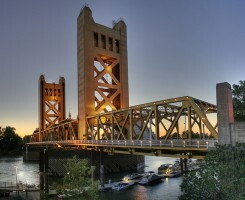 Located just across the Sacramento River from downtown Sacramento, West Sacramento’s waterfront offers a new, energy-efficient neighborhood connected to the sought-after jobs the state capital is offering. California removed its prohibition against offices located west of the river, opening up the market for Class A office space. Unlike Sacramento, the location offers the advantage of high ground. In addition to its mile-long frontage on the river, much of the district is on a bluff above the floodplain, eliminating the need for levees. The Bridge District Specific Plan includes 4,000 housing units and 5 million square feet of commercial and retail space to be built by 2035. The district will be developed as four mixed-use, walkable, transit-oriented neighborhoods with landscaping and open spaces that link to the mostly public access waterfront. A new bridge will accommodate motor vehicles including buses, a proposed light rail system, bikes and pedestrians and “urban standards” are emphasized. The plan defines the scope of improvements eligible for public investment and indicates possible funding of the investment. Prior to the revision of the initial Bridge District plan, the city was able to work with property owners and developers to build Raley Field for the Sacramento River Cats baseball team in 2000, the 196-unit Ironworks Homes & Lofts, and to form Community Facilities District (CFD) No. 23 to pay for removing the riverfront rail spur and other public improvements. In the CFD, two-thirds of property owners have approved a special tax on real estate—in addition to the regular tax—to be used for infrastructure improvements and other public purposes within the district. Property owners’ willingness engage in this plan is solid evidence that the best way to achieve high-quality developments is through cooperation between city and property owners. The CFD was one of two primary sources of infrastructure funding. The other was tax increment financing (TIF), using the increase in tax revenues generated by new development to repay bonds issued by the West Sacramento Redevelopment Agency. The elimination of California’s Redevelopment Agencies (RAs) in 2012 left a funding gap that is being addressed in several ways. In 2014, the city formed Infrastructure Financing District No.1, allowing it to use TIF to fund public improvements. Infrastructure financing using TIF was simplified by California Senate Bill 628 in 2014 and Assembly Bill 313 in 2015 that authorized cities, counties, and special districts to cooperate in forming Enhanced Infrastructure Financing Districts (EIFD) and issue TIF-backed bonds. West Sacramento is working with the City of Sacramento on an EIFD for the construction of Broadway Bridge connecting West Sacramento with Sacramento. Other revenue sources are impact fees generated by development outside of the Bridge District that represent a fair-share amount for benefitting from district infrastructure. The district received a Watershed Restoration Grant through California’s Water Quality, Supply, and Infrastructure Improvement Act of 2014 to improve a segment of its River Walk Promenade that traverses the district along the river, connecting in the north to the existing River Walk Park. It received a Proposition IC Grant for constructing the infrastructure and amenities necessary to support the city’s commitment to 731 residential units, 198 of which are considered affordable based on area median income. Living in a transit-rich neighborhood close to job centers is a tremendous energy saver. An easy-care home within walking distance to shops and restaurants suits the modern household of one or two persons who work at demanding jobs, sometimes also raising kids. These are Americans who value neighborhood amenities and choose to live in dense neighborhoods connected to workplaces because they want to enjoy civic life, recreational and cultural opportunities, restaurants, coffee shops, boutiques, gyms, yoga studios and more. These are the best places of our time, and California’s West Sacramento Bridge District project has shown us how we can transform a once-forgotten area into a bustling center of renewed and sustainable activity with a little creative financing and determination.